Our professionals are hard at work in Pensacola performing Spray Nozzle Water Leak Testing with AAMA 501.2 standard. Lookin’ good Ryan Bunch! WHAT IS SPRAY NOZZLE TESTING? The AAMA 501.2 standard is designed to test the water tightness of large glass areas that are permanently sealed. These areas usually include storefronts, curtain walls, and sloped glazing systems. The entire principle behind the spray nozzle water leak testing is to identify issues with the installation of the glass area. The test itself focuses on at least 100 square feet of the wall and includes the edge of the glass surface. WHY IS SPRAY NOZZLE WATER LEAK TESTING IMPORTANT? A water leak in your curtain wall, no matter how small, can cause serious issues for your building and your tenants. If any leak is identified during AAMA 501.2 testing, you can remedy the issue easier if caught before the interior of the building is finished. If the leak isn’t detected until the building is complete, you could end up spending a large portion of your building maintenance budget correcting the leak issue, not to mention, the leak could cause mold and mildew to form. WHEN SHOULD WATER LEAK TESTING BE PERFORMED? Because unfinished walls reveal moisture better than finished walls, ideally the test should be performed before the walls of the interior of the building are finished. 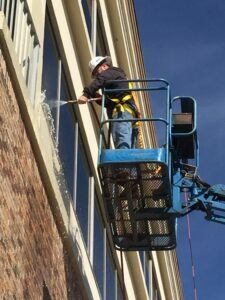 The goal of the leak test is to identify any issues with the building curtain wall that could potentially allow water leakage or intrusion. According to the AAMA 501.2 standard, water leaks are any uncontrolled water that can cause damage to adjacent materials or finishes. If the issues identified by leak testing are not properly addressed before finishing the interior of the building, water could leak inside of the building and cause serious damage to the finished components. WHO SHOULD PERFORM SPRAY NOZZLE WATER LEAK TESTING? Spray nozzle water leak testing needs to be performed by a qualified building envelope testing company. The guide for testing is very specific and must be followed in order for the test to be completely accurate. A constant pressure of water between 30-35 psi is applied from a ¾ inch hose fitted with a Type B-25 brass nozzle. As the water is sprayed, the nozzle is held one foot away from the glass and moved slowly back and forth for five minutes. Before you put the finishing touches on your building, let the professionals at NOVA make sure the building is watertight. Contact us today to schedule your water leak testing!